Gresham resident Fred Wilmot Sprenger, 86, died on June 10, 2017, at his home in Gresham, OR. Fred was born in Grandview, WA, to Howard and Elizabeth Sprenger. The family moved to Zillah, WA, before his first birthday. He graduated from Zillah High School in 1949, and received a bachelor’s degree from Washington State College in 1953. He served in the U.S. Air Force from 1954 – 1956, being discharged as a 1st Lieutenant. Following his military service, he married Carole Watson in Grandview, WA, on June 16, 1956. (They met as students at WSC.) He started his career with the U.S. Forest Service in Vancouver, WA, and from there they moved to Grants Pass, John Day, Steamboat Ranger Station, and eventually the Region 6 Timber Management office in Portland, where he retired from government service in 1989 after 34 years. 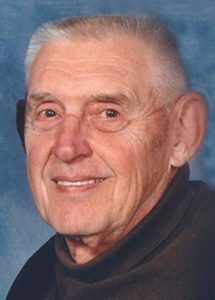 He has been a member of Covenant Presbyterian Church since 1968, where he served as a deacon, an elder, and in many other positions. He was a lifetime member of the Masonic Lodge, and joined the Pleasant Valley Golf Club in 1970. He was a very competitive swimmer, and was Northern Division Champion at Washington State College four years running. He continued to swim while representing the U.S. Air Force in the Far East Championships. He swam with U.S. Masters Swimming for over 35 years, and was a National Champion in 1977. He was a familiar sight as a starter for Eastmont Aquanaut swimming meets and also the house starter for years at Centennial High School swim meets during the time that his sons swam competitively. He also enjoyed annual backpacking trips with his children and extended family, and eventually with his grandkids. On November 17, 2009, he married Wendy Couch, with whom he got reacquainted at their 60th high school reunion. They spent a number of years traveling abroad, winters in Yuma, AZ, and were fishing partners during the summers in Alaska. Fred also had Wendy’s 13 grandkids to hang out with , which he enjoyed very much. He was preceded in death by his first wife, Carole, and his sons Douglas Lawrence Sprenger and John Charles Sprenger. He leaves his wife, Wendy, of Palmer, AK, and sons David of Portland, and James of Medford, OR; sisters Mary Linker of Wapato, WA, and Ann Hankins of Winlock, WA. He also leaves six wonderful grandkids. I served with Fred in the USAF overseas in Japan in 1954 and 1955. He was my closest friend. We met several times after we were discharged, and I enjoyed when he remarried after Carole’s death. I shall never forget him. I also swim, and until I retired I was the announcer for many boys and girls swim meets at Jeffersonville, Indiana high school. in Indiana. We did many different things together when we were in Japan, and were “young and happy” I shall never forget him.